Firstly, a quick thankyou to all those that have supported and taken delivery of one of my gum tree CD's. I am really appreciative of how well these have been received, and the future shed is happy with the support as well, however, the shed construction is on temporary hold...not due to funding, just the decision to put in some hard modelling time instead of outdoor construction during a cold and wet winter. So, the new project that has pushed the shed aside for the moment...O-14. Yup, change of scale. Not forever, just it was on the "always wanted to do that" list. My previously documented layout construction for "Brooks", has been put on hold. It actually had some initial scenery work started on the station module, but the initial idea to perhaps have it ready to take up to Sydney next year for the 12th Australian Narrow Gauge Convention was always going to be a really tough deadline to meet. Besides, being it was going to be part of my home layout eventually, I didn't really want to rush through the process for the sake of the convention. It will just make its convention appearance at a later event (perhaps here in Geelong...nudge nudge, wink wink!). On to that new layout then. We spent a bit of time browsing around what had previously been modelled, and deciding what we thought worked, and what didn't. Geoff only has limited space at his place to house the finished layout (unless he can eventually convince his wife that a long layout in the new extension family room would look spectacular!). I was also happy that it was a fairly confined size that I could just scratch that O-14 itch with (I didn't want to fully convert!). We had a narrow doorway the layout had to negotiate, and also wanted to make transport easy, by just restricting its cartage to in the car only, and also keeping exhibition set up quick and easy. 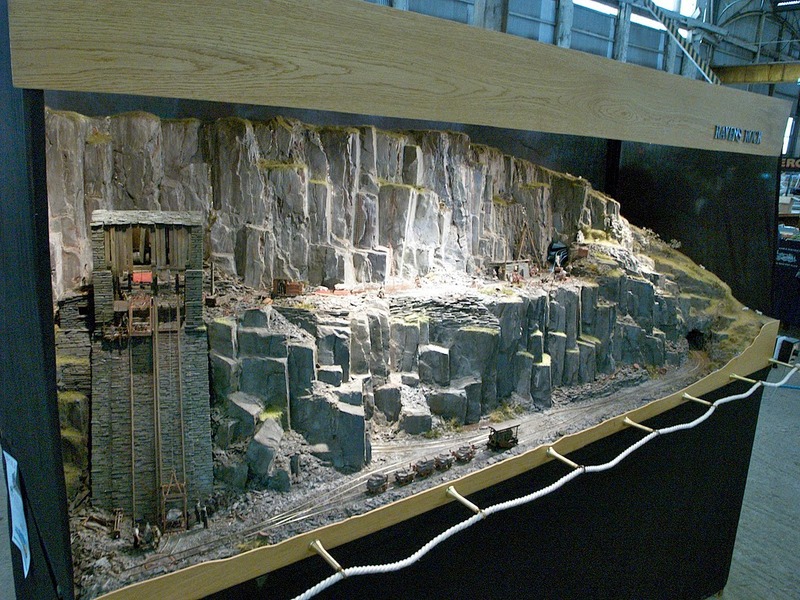 We were doing a Welsh Slate theme, and in browsing for ideas, came across a layout called "Ravens Rock". For me, this layout ticked a lot of important exhibition boxes. The chosen layout vehicle is Geoff's RAV4, which has good height inside when the rear seats are pulled out (easily done). We are taking a lot from the vertical appearance of Ravens Rock, but changing a number of the feature scenes, such as the incline has been removed in exchange for a different scene. The layout has been framed in aluminium, and clad with ply, to keep it all nice and light weight, yet strong. The great thing about the aluminium is it's so quick to work with. From the drawings I made (after measuring the car), I had the frame members cut and assembled in less that an hour. 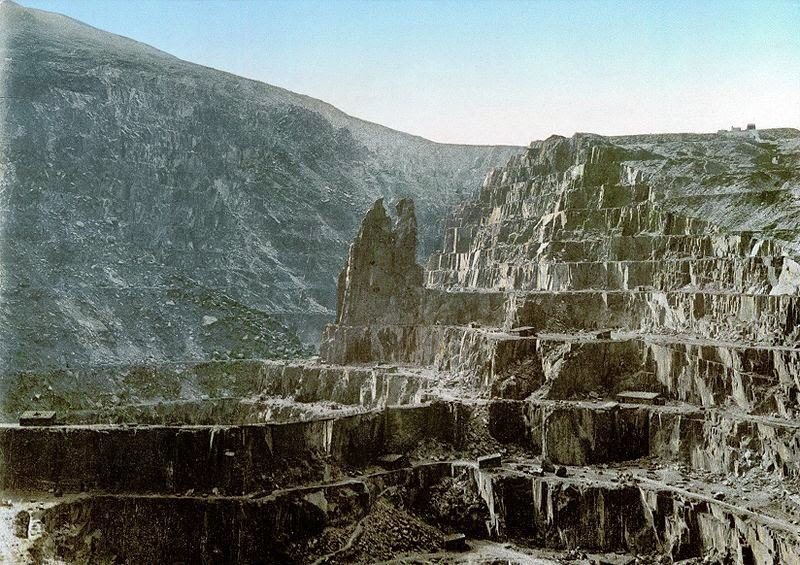 The photo above, of Bethesda Slate Quarry, gives a good impression of what I need to carve out. The different levels (galleries, or terraces) are both harsh and spectacular. Given that this entire layout is essentially a rock face, the challenge is to keep it light weight. When researching the background of Ravens Rock, it was documented as a exceptionally heavy layout, shaped with plenty of heavy plaster. That's perhaps the biggest challenge of this project...so much "rock" with no weight. I've got a few ideas to test out in the coming months, avoiding a plaster mountain at all costs!